Julie’s Park Cafe & Motel is conveniently located in Fish Creek at the entrance to Peninsula State Park. Our customers love this location where they can walk or bike right into the park. Peninsula Park has great hiking and biking trails as well as a historic light house and lookout tower. The restaurant and motel are also within walking distance to shops and the beach. Fish Creek restaurants have a wide variety of culinary flavors, and the quaint town has many attractions. The history of Julie’s Park Cafe & Motel began in 1997 when Julie Giller purchased the Black Locust Restaurant and converted it to Julie’s Park Cafe. The Black Locust was a very upscale restaurant. The motel’s name was the Peninsula Motel. Julie completely remodeled the cafe. The cafe’s menu changed completely. Today, Julie’s Park Cafe is quite unique among Door County cafes and Fish Creek, WI lodging. 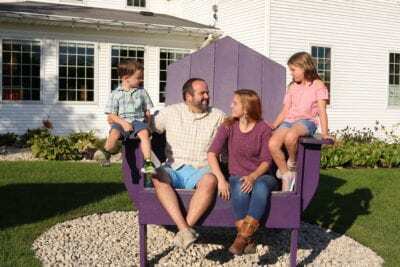 Why a Door County Lodging & Restaurant Business? Shane & Sande Solomon worked for Julie as managers for the 2009 season. In March of 2010, they purchased Julie’s Park Cafe & Motel. Prior to working at Julie’s, Shane had been a university administrator and Sande had taught English as a Second Language and Spanish. Both Sande and Shane had worked in restaurants in the past and have loved the hospitality industry. They also have family in the business of Door County lodging. 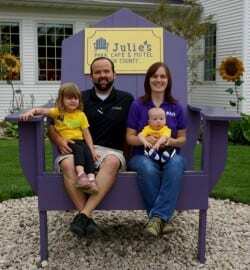 The Solomons had the opportunity to purchase Julie’s and are very excited about owning the business. In keeping with their goal of 100% satisfaction of guests, Shane and Sande look forward to continually updating the motel rooms as well as keeping things fresh in the cafe. They are dedicated to keeping the tradition of Julie’s alive and making the establishment more of a fixture in Door County. Whether you’re stopping in to dine or staying in the motel, say hello to Shane, Sande and the Julie’s family.